21 weeks already! I'm a day late this week, but Dan and I spent all last evening cleaning out my side of the closet, which was a HUGE undertaking (seriously, you have no idea) and I was too exhausted to move to the computer to blog afterwards. Time is flying and I am feeling more whale-like with each passing day (and more anxious about my to-do list, I know I say it every week!). 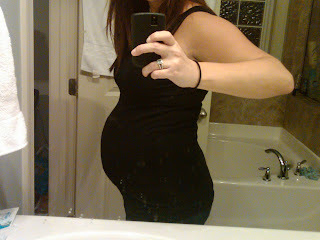 I still have a long way to go, but I'm sure it will fly by much like the rest of this pregnancy has thus far! We are at the beach with my family for a mini vacay, so I'm going to keep it short and sweet for the first time ever tonight. 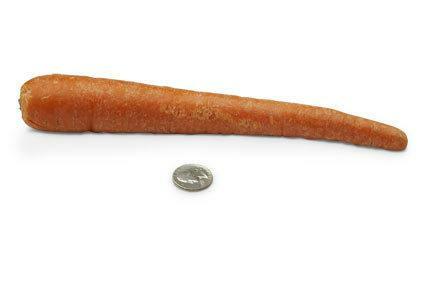 Size of Baby B 2.0: Baby Boy weighs 3/4 of a pound and is around 10.5 inches long, about the size of a carrot. He now has eyebrows and eyelids and will start to move a lot more. Weight Gain So Far: I actually have not weighed myself this week because I forgot to do it before we came to the beach. I think I must look huge because someone asked me this week if I was sure I wasn't having twins. PUNCH. Anyway, I'm sticking with 8 lbs for now and hoping that all of the recent doughnuts won't come back to bite me. Cravings: Still digging tomato soup and grilled cheese from Cafe Carolina (or lentil soup from Whole Foods), and of course still inhaling the Golden Grahams. Aversions: Thankfully, we're still in the clear here. Symptoms: No changes. Exhausted, 24/7 full bladder, a little cramping, a few headaches. My weird skin rash under my wedding rings has finally cleared up so I wore my rings today for the first time in weeks. We'll see how long I can do so. Movement: Baby boy has really started moving this week. His movements are still sporadic but I have noticed longer stretches of movement and I'm loving every minute! It may sound weird, but I missed that part of my pregnancy after Lilly's birth. What I Miss: I can't really think of anything that I miss this week. I think I've been too busy! What I'm Thankful For: PTO and fabulous weather. Although I have a few things I need to knock out for work tomorrow morning, I am looking so forward to shutting down and relaxing for a few days. I can't wait for the rest of our family (especially my nephew, Mason!) to get here on Friday! The weather forecast says it's going to be glorious, and Mom says it's been beyond perfect all week. Bring on the sunshine! Also thankful for an easygoing baby girl who was awake for the entire car ride to the beach, but went to bed over two hours late with no problems whatsoever after arriving, getting a doughnut from Aunt Hopey and exploring for a little while. Love her! What I'm Looking Forward To: October has a lot of fun things in store! To name a few, we are planning a trip to the pumpkin patch, there is a "costume parade" at Lilly's school (seriously can't wait for this), Halloween, and we get to meet baby Dorothy...the list goes on! Next Doctor Appointment: October 22 with my homegirl the Nurse Practitioner. That's it for me! It's not likely that I'll blog for the rest of the week, but I'll be back Sunday or Monday, surely with millions of photos to share. Halfway there! I am a new follower and I absolutely love the name of your blog, too cute! Thanks for following along, we're glad to have you! The blog name was actually my husband's idea, but I love it, too. :-) Nice to "meet" you!